Visiting Barangay Andap, New Bataan for the first time a week or so after typhoon Pablo, all I saw was this long stretch of nothing but boulders and rocks. Two months or so later, I’ve decided to go for another trip to the same place (this time with some members of the family) and this huge tomb is the only thing you can find on that still long stretch of boulders and rocks. 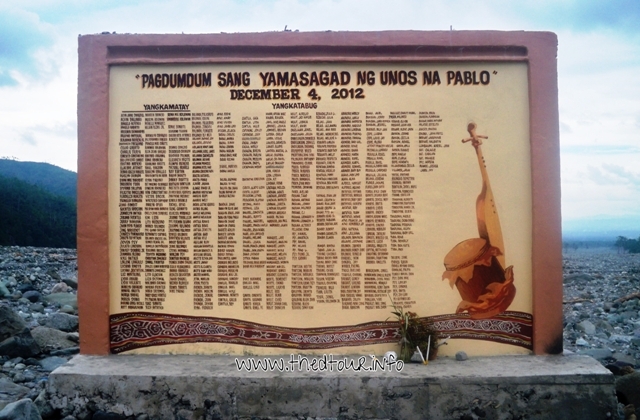 In English translation, the tomb reads: “In Memory of Typhoon Pablo’s Victims. Yangkamatay means "dead" while Yangkatabug means "missing". 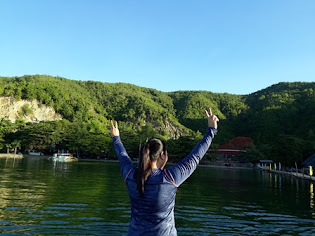 On this stretch is where the landfall happened and can you believe the flood water level that even out this once hilly place was as high as a standing coconut tree? The average height of a coconut tree is typically 5o-60 feet while long coconut trees can grow to a height of 80-100 feet. If you can’t get even the slightest idea of how devastating that was then you probably have to watch natural disaster films like “The Impossible”.